Join us for a day of comradery, lunch, a boat ride, and shopping at Hubbard’s Marina. Enjoy a Dolphin Boat Adventure and eco tour, followed by lunch! After the Dolphin Adventure we will have time to browse some of the 100 merchants who inhabit the Village with unique retail shopping, and to select from a variety of restaurants for a late Dutch lunch. 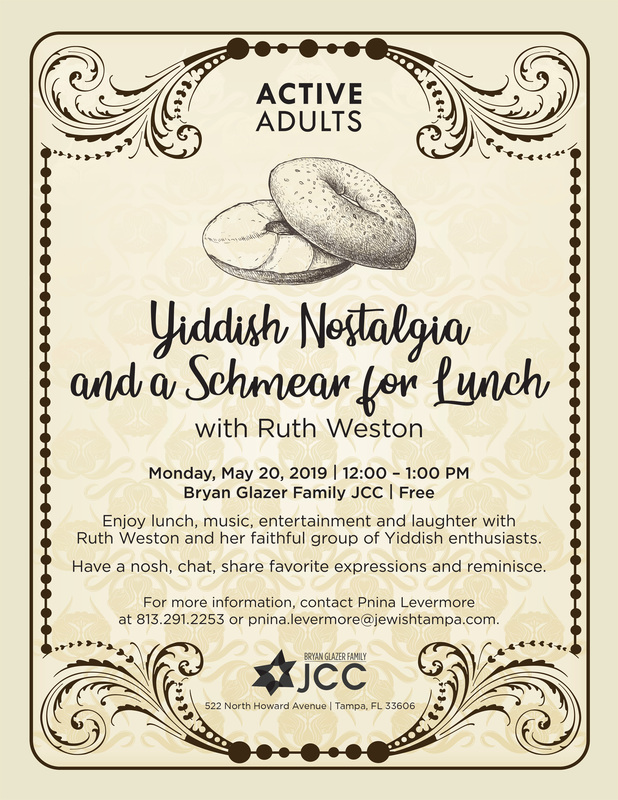 Enjoy lunch, music, entertainment and laughter with Ruth Weston and her faithful group of Yiddish enthusiasts. Have a nosh, chat, share favorite expressions and reminisce. For more information please contact Pnina Levermore, Adult and Senior Program Manager, at pnina.levermore@jewishtampa.com or 813-291-2253. Have a question or ready to join? Contact a membership specialist at (813) 575-5900 or get more information here. Copyright © 2019 Bryan Glazer Family JCC. All Rights Reserved.